Children's Firearm Safety Alliance - Page 3 of 10 - A coalition of physicians, law enforcement, prosecutors, lawmakers, gun violence prevention organizations and others focused on reducing the number of unintentional shootings of children with access to loaded, unsecured firearms - through policy advocacy, legislation and education. It’s beginning to feel like Groundhog Day; bad news about gun violence keeps popping up with maddening regularity. Today we learn that 3.5 children die from gun violence every day and 15.5 more are injured. Specifically, a study in the journal Pediatrics has reported that between 2012 and 2014, 1,300 kids a year, on average, were shot and killed, making firearms second only to motor vehicle accidents as a cause of injury-related deaths. And make no mistake about it, this is a uniquely American tragedy. Among the world’s 23 richest countries, the United States accounts for a whopping 91 percent of all firearm related deaths of children under 14, according to the Los Angeles Times. 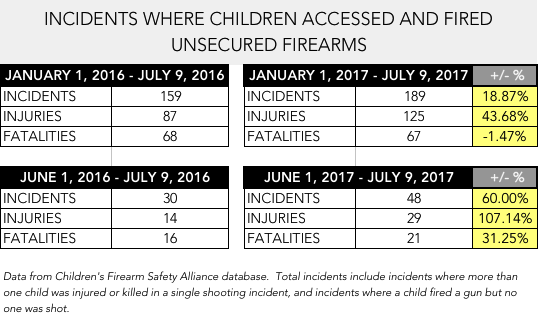 The children who fit the category of unintentional firearm injuries – “accidents” – are the most difficult to contemplate. They were often shot at home by another child while playing with a gun or showing it off. Too many of these children are toddlers. An investigative report by the Washington Post in 2015 found 43 instances when a toddler younger than 3 years old shot somebody; thirteen killed themselves. It is a parent’s worst nightmare. The Pediatrics study is so disheartening because with the exception of homicides, most of these shootings are easily preventable. All it would take is a genuine effort to improve gun safety in the home and to remove impediments to the development and sale of smart guns. As for homicides – and suicides – we need a better understanding of the societal, cultural, and familial pressures that drive a kid to kill kids – or himself. Congress should repeal the Dickey Amendment, which has for 20 years prevented the Centers for Disease Control and Prevention from undertaking research into gun violence. The National Rifle Association and its lobbying arm have used their significant power over elected officials to prevent progress on all these fronts. Why? Because they view each as a ploy by enemies of Second Amendment rights to confiscate their guns. Truth is, some serious gun control advocates don’t much like the idea of a technological solution either since they fear safer guns will make it harder to ban or limit firearms. Our representatives in Austin and Washington D.C., could settle this argument once and for all. Take the side of their youngest constituents and just say no to the NRA. Require under penalty of law that guns be safely stored, support research into the causes and prevention of gun violence, and encourage development of smart gun technology. But don’t take too long. Kids are dying every day.